Woman doing relaxing yoga exercises after workout. 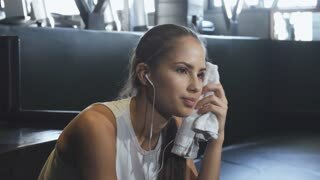 Young pretty girl with curls wearing light sportive clothing and using smartphone with headphones while relaxing afer workout in gym. Woman relaxing on a city bridge after a workout.